Optics Valley represents the young and fearless alter ego of Wuhan. As the newly rising East Lake High-tech Development Zone, it is enjoying some of China’s fastest enterprising development whilst establishing itself as the terrain that enables people to experience another side of a city in high-speed development. Operating across an area of 11,000 square meters, Wuhan Optics Valley Book Town is the largest branch of Wuhan Xinhua Bookstores. It is also the largest of its kind, offering the most comprehensive variety of books in Central China. Optics Valley Book Town provides multi-functional and all-round services for readers, including self-service book information and book ordering and delivery. It organizes various academic exchanges, reporting meetings and lectures, and is gradually developing an academic exchange mechanism that is distinctive within the book world. Zall Bookstore is a crossover cultural experience center integrating reading, leisure, exhibitions, symposiums and salons. It owns over 40,000 kinds and 80,000 volumes of books in total. The bookstore serves a unique approach to popularity and preference, offering popular-selling works based upon sales volumes as well as selecting books from bestseller lists, providing and recommending books specifically catered to their clientele. CGV Cinema is not the bells-and-whistles stereotype of a contemporary cinema; and yet its vintage American style has gained itself popularity amongst all ages. CGV Cinema in Wuhan Optics Valley brings the audience an excellent movie watching experience by applying advanced technology and operation service concepts within a traditional setting. The Giant Screen Cinema, a national leader in cinema technology and operation, is a movie-themed cultural town in the Optics Valley. Its well-equipped facilities allow moviegoers to immerse themselves in the films in its 11 halls with 2,500 seats offering widescreen, 3D and 4D viewing. Huayi Bro. Cinema has nine halls, each with their own style, creating a distinctive environment for the audience. Sitting next to the mountain by the river, Yishan Golf offers picturesque natural scenery. There is an international championship-level golf course, high-end residential communities, golf clubs and boutique hotels in an area of 2,330 mu (155.33 hectares). The first of international championship level courses in Central China, it is also the only one to hold international golf games. The golf club requires exclusive membership. 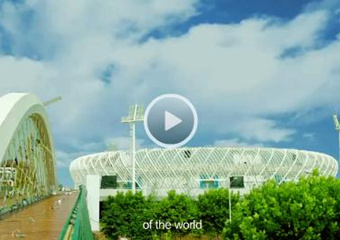 Optics Valley International Tennis Center consists of a 15,000-seat main stadium, a 5,000-seat tennis court, a 5,000-seat comprehensive hall and a 3,000-seat tennis court, reconstructed in line with that of Hubei Olympic Sports Center. 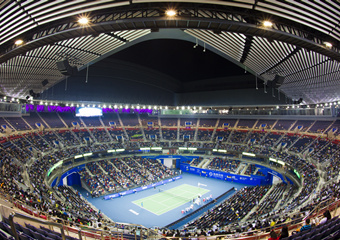 The stadium outside gives the illusion of a whirling tennis ball, and has appropriately been named as “Whirlwind Tennis Stadium”. The main stadium of the Optics Valley International Tennis Center also has a retractable roof. It is the third of its kind in China and the first in Wuhan. 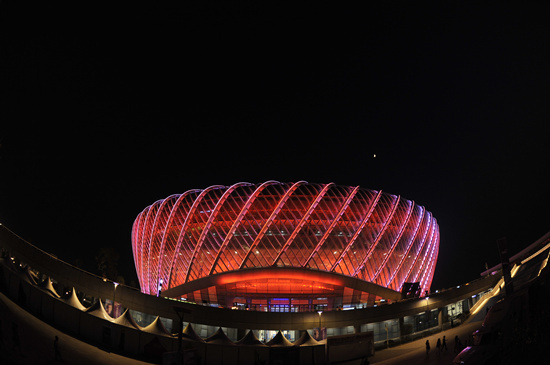 Hubei Olympics Sports Center is the largest and most modern comprehensive sports venue in Hubei's history of sports construction. Covering an area of 1,000 mu (66.67 hectares), the center is equipped with leading training and competition stadiums as well as facilities for a variety of sports such as tennis, basketball and swimming in a building area of 140,000 square meters. Moreover, the center also includes a reporting hall, research institute, rehabilitation center, physical checking center and supporting facilities such as hotel. Located in the main campus of Huazhong University of Science and Technology, the Optics Valley Gymnasium includes a main stadium, a training stadium and supporting facilities. It is a modern, comprehensive gymnasium integrating sports games, sports teaching and research. Established in Wuhan in 2001, VOX Livehouse is Wuhan’s first organizer of rock shows. Zhu Ning, the bar’s founder, is the former drummer of one of China’s earliest punk bands. Located at Lumo Road in Optics Valley, VOX Livehouse is becoming one of the most important venues for rock performances, with the future of some local bands being cultivated in the bar. Performances are almost daily, with different music styles ranging from punk to rock, folk to pop. Helens Bar integrates cafe chique with Western cuisine. Southeast Asian elements are incorporated into the bar, which is neither too quiet nor too crowded. The bar provides both meals and beverages to the background of classic European and American music, making it a good choice for students and workers to unwind.